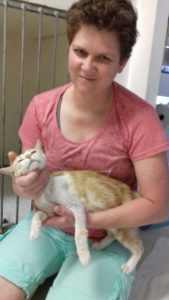 Buttercup, a young mama cat from Firgrove near Somerset West, underwent leg surgery at our EberVet Pet Clinic after being knocked down by a car. The brave ginger has four kittens. A snapped humerus did little to deter Buttercup from caring for her kittens. In fact, in spite of the pain, Buttercup did her very best to feed and bathe her four babies. 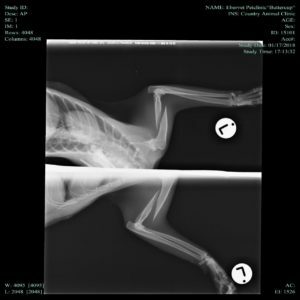 Pet Clinic veterinarian Dr Reneé repaired Buttercup’s humerus by attached the broken bones with wire clasps. 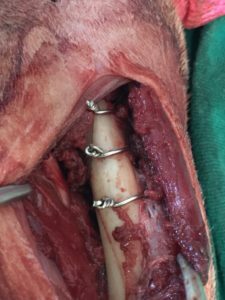 She is undergoing physiotherapy twice a day to help speed up the healing process. 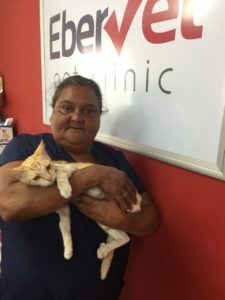 When she is well enough and has been sterilised, Buttercup and two of her babies will go home to Maureen Abrahams, the housekeeper at our clinic who rescued her from her first owner. The other two babies will be rehomed by Helderberg Animal Rescue Team.